More in "Wall Gallery Designer"
Professionally framing a single picture can cost hundreds of dollars. Framing cost alone makes exhaustive exploration of gallery composition, color and size possibilities with real framed pictures prohibitive and creativity limiting. If you want an awesome and unique gallery, the app would be worth it even at $100. 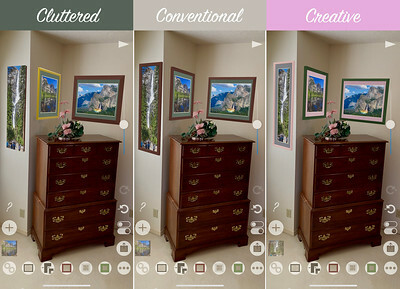 Professional interior designers and photographers will also find the app a valuable tool for expanding their sales and worth way more than its price. For example, portrait photographers interested in selling many large prints will find the ability to display a framed gallery of family portraits on walls in the family home are apt to sell more large framed prints. Because the Wall Gallery Designer allows immediate changes, the family can be engaged in adjusting the gallery to match their preferences. A family that participates in the gallery design in their own home will value the result much more than a stack of prints. Tired of subscriptions or additional, surprise costs to unlock features? I've created Wall Gallery Designer Lite to give you a sample of the full app Wall Gallery Designer at a very low price. Your purchase of the full Wall Gallery Designer means you'll have full access with every update and new feature included, and you won't be asked to buy any additional products. Tap the button below to download the app from the App Store.